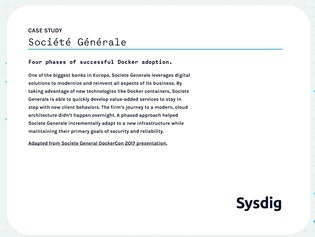 Societe Generale, one of the largest banks in Europe, wanted to move their applications to containerized environments. But with millions of customers and nearly 1,500 applications in their investment bank, they needed to make the transition as smoothly as possible. Open this case study to learn about the four-phase plan that helped them ease into Docker adoption, and the monitoring and security measure they set up to help manage their large infrastructure.